I am a big fan of connectivism (Stephen Downes, George Siemns , Alec Curos, CogDog and David Cormier). I had my first experience with CCK08. I started this blog on Wordpres based on that experience and I have used it with other MOOCs over the years to include this one. I am a consultant working in the learning, education, and training and a big proponent for human performance technology and informal learning. I continue to take these courses as part of my life long learning quest to include some of the “other” MOOCs. The biggest reason is because the great connections and the continuous dialogue. “What’s a W&M degree worth?” was the lead headline on this mornings print version of the “Virginia Gazette”, here in Williamsburg VA. You will notice that in the web addition of the article the subtitle reads, “New W&M grads not top earners, but data likely failed”. I do not know for a fact that the data for the article is the same data that Jeff Selingo (The 5 Disruptive Forces That Will Change Higher Education Forever) cited, which was from the state of Virginia’s unemployment records. But my guess is that there is not much of a difference if any. The article’s database is from the State (Virginia) Council of Higher Education that compared salaries 18 months after graduation, based on majors from dozens of two-year and four-year colleges. W&M economics professor David Feldman, and Bob Archibald co-authored the book, “Why Does College Cost So Much?” stated in the article that the database used “doesn’t include grads working outside Virginia or those working for the federal government, including in the military.” There are a lot of Virginia grads working for the federal government in northern Virginia. I assume from this that the unemployment data from Virginia, that Jeff Seliingo, cited, did not include grads that are unemployed outside of the state of VA or the population of grads who went on to graduate school right after graduation. Ok the data may be flawed and this is nitpicking but at the end of the day it does not alter the validity of Jeff Selingo’s over all argument – there are disruptive forces that are changing HE and there are risks and opportunities. I for one, am looking for the opportunities. I haven’t blog since CCK08 and then some on LETSI in 2009 so this is almost brand new again and so we are off on a new adventure with EdStartup 2012. As I looked through the first week’s assignments I got kinda of excited like when I first started the CCK08 – something new, a new perspective, a new set of tools, a new set of skills, a whole new set of connections and a new adventure. I am back to my blog, that I used during CCK08 and it’s nice to be back after sporadic usage. I come to this course not as a educator but as a life long learner who is on the informal learning side of the spectrum. I also approach the “problem” from a HPT/performance/ Joe Harless perspective where the answer to the “problem” is not necessarily a training solution. “Learning” is not the end goal – specific “Performance Competence” is. So my last touchstone with learning theory comes from CCK08 and 09/Connectivism. During the CCK08 I was exposed to and used a whole new set of tools within the context of a connectivism pedagogy. As I have followed the conversations over the last two years the future of higher education and it’s high costs are headed in the same direction as vinyl records,CDs and printed newspapers. EDUPunk/OER and folks like Siemens and Downes are pointing to an alternative path/future. At the end of the day, I am looking for a continuation of the conversation that began, for me with CCK08, and I am very much interested in participating in the formation of an “alternative” path. For those that were on spring vacation I wanted to update you all on our last meeting which was highlighted with a tour of the project’s software development site on SourceForge. There was a great discussion led by Mike Rustici, Chuck Allen and Schawn Thropp on the project concept model. There is general agreement on phase 1 and the notion that the authentication by a web services by separating the SCO from the server side opens up a whole set of new possibilities and solutions to known problems e.g. cross domain scripting, synchronous vice asynchronous, multi player access to a SCO, access to multiple LMSs, etc. Exciting possibilities and it brought back to mind the great set of discussions that we had last summer with the SCORM 2.0 200 plus white papers. From my point of view we have passed from talking about issues and embarked on taking the first set of steps to solving those issues we discussed last summer and came to a consensus about in Pensacola. As most of you know, one of the things that make LETSI different from others is the notion that we will develop open source software solutions in parallel to pursing a standard. An innovative approach and consistent with our community’s idea that “working code trumps all theories” To that end we discussed our first stab at an IP Agreement. * You retain ownership/rights over everything that belongs to you that you contribute. * You grant LETSI and others in the LETSI community who has access to your contributions a royalty-free license to such contributions. * In turn, LETSI makes its work available under the Simplified BSD license. This is a “business permissive license” that allows derivative works. Under BSD, you are free to modify, use, redistribute LETSI work as you see fit. Occasionally, members may want to volunteer use of a system or content for testing or similar purposes or might otherwise want to reference or discuss a proprietary system or approach as an example of industry practice. These situations can be accommodated without such materials/systems being deemed contributions — If these situations arise, simply be explicit as to your intentions, record in meeting minutes, memo agreement, etc. If you are interested in participating but not quite sure dial in to one of our online meetings this coming Wed at 1200hrs EST (15 April) the project’s software developers will meet and the following Wed 22 April the general project members will meet at 1200hrs EST. We kicked off the project 25 March, with 16 folks joining us for an overview of the project and its goals. Documents and minutes are posted on the project site. One of the key discussion points was the need for a conceptual model for the web services API to manage run-time communication between learning content and a LMS or similar system. Chuck Allen, Mike Rustici, Schwan Thropp, and Chris Guin have sketched out an outline and approach for the conceptual model which will be discussed at our second working session 8 April 09 1200hrs EST. If you have the time dial in and “brown bag” it with us (see below for details). We are looking for developers to participate in the project. Below is a rough breakdown of the phases and the requirements that would be handled within each phase. One of the key items for discussion I think will be signing up developers that are willing to look at different implementations – WS* or REST. If you are interested contact us or attend this upcoming session on 8 April. The first phase would be narrowly scoped. The work would largely be based on the conceptual model for the SCORM RTE as it exists today. Essentially, this can be thought of RTE web services designed within a SCORM 2004 context. However, certain extensions are contemplated for deployment within web services and to meet high priority requirements. Phase 1 itself would iterative and include several milestones and associated deliverables. 1. Working with essentially the same a set of operations as in the BBN web services RTE prototype. The BBN design would be updated so that it was “wrapped, doc/literal” style and conformant with WS-I basic profile. * An indicator to let the LMS know that the content will support the web services API. * Elements to support the communication of credentials for access control. For example, an LMS ID and shared secret. * Authentication of valid web services calls to the LMS. This might involve specifying use of some subset of WS-Security security tokens or simple convention using a share secret. * Defining how the launch of the content occurs. This initially would look at scenarios where the initial launch of content (whether browser-based and non-browser based) was browser-based. However, launch details for non-browser based content (e.g., Adobe Air) also would need to be considered. * The web services API would need to be scalable. Of particular concern are the GetValue, SetValue operations. In the BBN prototype based on the ECMAScript API these are designed to communicate single parameters. Some notion of batching the communication of these items is necessary to minimize the number of calls across the network and optimize performance. * There is the need to support asynchronous scenarios and sessions across extended time periods. The initial focus may be on scenarios involving content that was initially browser launched. * Asynchronous/extended session support for content that wasn’t initially browser launched. (WS-I Reliable Secure Profile?). Phase 2 would not be bound by the current SCORM conceptual model. This Phase might incorporate new concepts being explored by other LETSI working groups (e.g., Orchestration). Phase 2 might be more “resource-oriented” from the ground up. Design the RESTful web services first. 1. The need for speed. The goal is to have some Phase 1 working code in near term and to work in an iterative manner to fulfill the above requirements and those that may emerge. * Community of Practice Representatives. Need to come up with the right division of labor and meeting cycles to support the project. 3. The two-phase plan doesn’t necessarily imply that the work occurs in sequence. 5. Many and various architectural and technical requirements. If you have about an hour on Wed 25 March, “brown bag” it that day and join us for the kick off of LETSI’s first open source software project – Web Services API for SCORM Runtime Communication. Bruce Roberts and Chris Guin from BBN will kick off the session to provide some background on the project along with some issues and challenges in taking the current code to the next level. Tyde Richards an Schawn Thropp are also scheduled to join in on the discussions. Chris’s brief as well as other project documents are posted on the LETSI wiki. As most of you know LETSI is taking a much different approach with its community source approach and an agile software development process, while at the same time maintaining and active liaison with Standards Committee. This project has an active liaison with the IEEE LTSC group and I expect Schawn Thropp will make a few comments on what the IEEE is planning. As a pilot project, the substance and process are of equal importance. We are making things up as we go along. Your technical contributions and involvement in building an open source software development environment are needed. One of the LETSI founders has contributed some infrastructure assets and for this project we will use Source Forge to manage the project and code. With the start of a new year, the learning and education blogosphere is full of 2009 forecasts. Predicting the future is tenuous at best, but talking about is a bit of fun especially when there is the prospect of looking back a year from now and seeing if you were even close. (Some famous bloggers even attempted to review their predictions from 1999, and surprisingly a couple of them fared well even 10 years later.) So her we go – LETSI will get off the ground and promulgate a set of open web services for the Learning, Education and Training community in 2009 is my prediction. Blogging is a new thing for me so I am going to attempt to give it a bit of a go and hopefully, add to the dialogue of learning, education and training. For those of you that are first time readers please take a look at some of the other postings below that were part of the CCK08 course. I am a big fan of informal learning, Stephen Downes, George Siemens and Jay Cross. I am a recent CCK08 “grad” — I have drunk the “cool aid” and believe in Connectivism. I believe that 80% or more of what we learn occurs outside of formal institutions and the outcomes could be much better on the informal learning side. I have spent the last ten plus years building automation systems to support Army training in their schoolhouses, and online learning delivery to include training development and training management systems. Throughout this time, I got involved with the standards business as a charter member of SCORM, with contacts to AICC, IEEE LTS, IMS and a bunch of others. At the end of the day standards are interesting but “working code trumps all theories” (Phil Dodd) and that bit of wisdom has grounded me, as well as helped me, to winnow through all of the chafe. So my first New Years’ resolution is to blog with a focus on learning, education and training (LET) and something called SCORM 2.0. There was a fantastic amount of energy generated over the last summer with the 200 plus white papers and formal comments. I am sure that those of you who attended the SCORM 2.0 Workshop in Pensacola have seen the minutes from the session. Since Pensacola, a small group of folks have attempted to organize your inputs into four buckets – Teaching and Learning Strategies, Architecture, Sequencing and Business Requirements – in order to layout a baseline. All of this is soon to be exposed in the near future. Now I know folks are a bit bummed out over the depressed economy and I hate to start on such a negative note, but Stephen Downes’s recent post on What Not To Build struck me as a worthwhile starting point as we begin the next phase of describing what SCORM 2.0 could be. The short version of what Stephen says is – Don’t build a CMS, Don’t build a platform-specific app, Don’t build a Java application, Don’t build a framework, Don’t build an educational game, Don’t build a new standard… WHOA what is this about? As a point in case, I recently began using a web app called TimeBridge to schedule and coordinate meetings with colleagues – which exemplifies this precise example. They did not attempt to create yet another online calendar program – they instead connected the various online calendars people already use, and let them interoperate (Google, iCal, Outlook, Yahoo etc). The end result is that people can work the way they choose, and still coordinate schedules ACROSS those varied platforms. That is an example of extension and coordination providing added value. Working with what’s there and extending it needs a little thought on the part of all of us. Given the diversity of the SCORM 2.0 community, the depth and breath of the participants, the white papers and the emerging notion that SCORM 2.0 will be built on “existing standardized frameworks and service architectures to potentially serve as base of new SCORM functionality”, this bit of advice of what not to build makes sense. What to you think we/LETSI ought to build in the near term – the next six to twelve months? I tend to see the glass as “half full” not “half empty” and therefore see opportunities. I have viewed learning as a lifelong pursuit and a mix of both formal and informal learning opportunities. 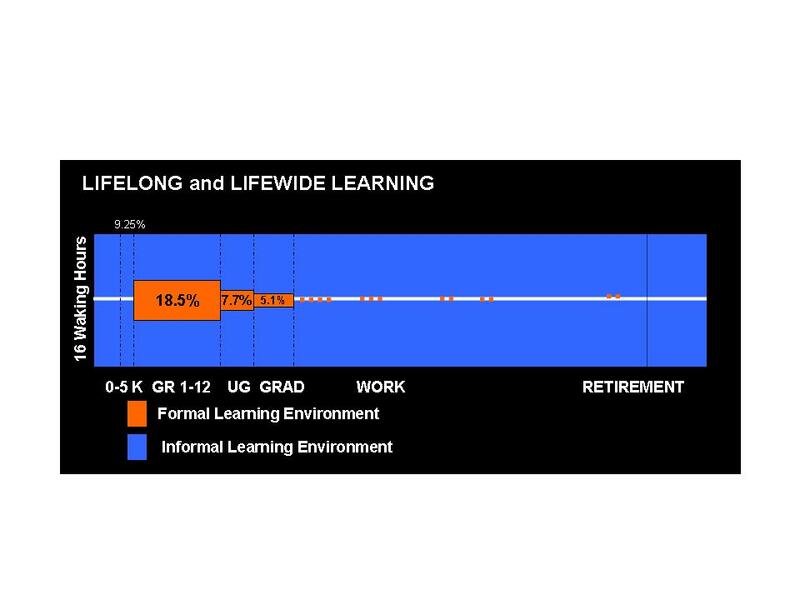 Roy Pea’s “Lifelong and Lifewide learning” graphic below, shows me that informal learning represents an opportunity. On the flipside there are barriers and challenges with that opportunity. This paper looks at those challenges for informal learning in the work environment that may well apply to the formal side. In my mind, the issue is not so much about the technology innovations, but with the culture. A struggle to make sense of it all. The last ten weeks of the CCK08 course have been, to say the least, an eye opener. The exposure to a whole new set of connections and folks that are deeply passionate with trying to make a difference in the future of learning. Trying to digest the points of views, the diversity, and connecting with the passionate intellectual energy was at times overwhelming — let alone trying to make sense of the right way to move forward. Now what! How do I apply it? What can I do to contribute? How can I make a difference? How can I belong and how can I contribute to a set of connections that exist in a network that is intangible? A theme that emerges is that the challenge is long term with no silver bullets or magic wands to wave over to generate instant solutions. Ideas do have substance in your mind as it connects and reflects and, at some point, becomes substantive in a plan, via actions and conversations. The path forward appears in the connected conversations – that you make a difference by what you do, the example you set and by your own contributions within a connected community – no matter how small or seemingly insignificant. Your persistent participation in the dialogue will make a difference. George Siemens gave a presentation “Learning Tech Strategy in Time of Change” as part of a week-long set of sessions – Corporate Learning and Innovations 2008 – that discussed a range of issues partly about the tools but did get at the cultural issue. Between the next presentations, that George moderated with David Weinberger (The Cluetrain Manifesto see chapter five), I got a chance to talk with George and my struggle with the third paper for CCK08. The heart of the issue comes down to the scalability of the conversations that occur within these “bottom-up” Communities of Practice (CoP) and the need for leadership within the institutional frameworks to nurture the innovations that occur from the bottom up. No easy or scripted solutions exist. There are, we agreed, some exemplars out there – Caterpillar on the corporate side and in government retired General Frank Anderson, President of Defense Acquisition University (DAU). Frank Anderson’s leadership has transformed a traditional brick and mortar institution with a redirected focus to its graduates/practitioners. The focus of the faculty and the institution’s emphasis is on the needs of the graduates/practitioners outside of the institutional setting – a commitment to their lifelong learning needs. That’s an example of leadership nurturing “bottom-up” Communities of Practitioners that has successfully bridged the cultural chasm and scaled the number of conversations. The other issue that emerged from David Weinberger’s discussion with George, along with the scalability one, is rewarding collaborative contributions. David introduced the idea that we will require new sets of metrics — not solely based on quantitative metrics but also qualitative indicators. The qualitative factors might be – the person that is the sparkplug that energizes the team, or the person whose skills bridge differences, or a demeanor that embraces the diversity of views and adaptive in their approaches, etc. In the end though, it is still about a value proposition so that the quantitative and qualitative metrics are measuring the individual/communities value creation by leveraging their connected network.